Wigan (a seaside resort in the north of England) is the home of the Pie Barm, a delicacy and Cuisine of the North, and ideal corporate identity and enemy to bearded eaters. This is sometimes known as the Wigan Kebab, though occasionally as the Wigan Slappy, Wigan Butty or simpler Wiganburger which may or may not exist like the Wigan wedding cake, and should not be confused with a cob, barmcake, stotty or oven bottom or, especially, a growler butty. Distant cousins exist in Belfast and Australia. An instructional video on making one, and a descriptive Teletext page. Legal: court proceedings may be taken, other variations exist, are occasionally available to southerners, and consult your doctor before commencing a Pie Barm-centric diet. So pie crust, surrounded by bread. And the pie ostensibly has potatoes in it. I was so disappointed the first time I bought a breadcake in a Yorkshire chip shop. Something should be done about that under the Trade Descriptions Act. Someday I will go to the UK. I plan to eat all the things and buy a very expensive pair of shoes in Northampton. I hadn't really planned on eating a pie barm, but as a completist I suppose I have to. A pie barm seems like a poor man's donut hamburger in a way. Disappointed that your "Australia" link goes only to an Australian news story about an American food fad. For a genuine Aussie link on this theme (Adelaide and Sydney, anyway), try the pie floater. This sounds amazing. A completely ridiculous concoction of several favourite things that should not go together. Must try. My main memory of Wigan is that the ASDA there had a large section of service counter devoted solely and entirely to pies. There's a town not afraid of its own reputation. And yet — somehow — there is more fat. There's nothing like hot hot carb-on-carb action. One of my favorite comfort foods in days of yore was to butter a slice of bread, bend it into a U shape, then fill it with Kraft mac and cheese. I swear unto you, the gods did not eat better. I would absolutely, 100% eat a pie barm and I would be happy while doing so. And then I would take a nap. I've had the Jamaican equivalent (a patty on coco bread). It was good, but felt a bit too rich. Mashed potato pizza is surprisingly good. So is the kind of Vietnamese noodle salad that comes with egg roll pieces. Actually, the only thing that holds me back about the pie barm is that the barm itself looks kind of dry. And the pie ostensibly has potatoes in it. Is the meat pie an exclusively UK/Australian phenomenon? Because when I think 'pie' I immediately think 'meat pie', and I'm assuming that this pie is fully of artery-clogging meaty goodness. The culinary equivalent of donk. 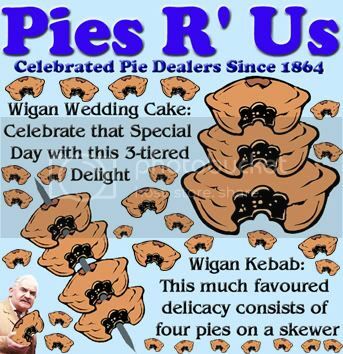 I would tend to assume that the pie eaters of Wigan are tucking into a meat and potato pie as standard, though it might be just meat in gravy. I prefer the chip barm to this, the barm thickly spread with butter which melts into the bread as soon as the hot chips are seized in its doughy claws. I haven't had one for many years (not really a thing in the Pacific Northwest*, but a good chip butty is a fantastic thing. Especially if with a good helping of "bits", the grease laden and browned bits of fish batter lost to the frying process then dredged out for reuse. Provides a nice extra crunch to the whole proceedings. *Maybe an artisanal butty shop, which cross-promoted its "bits" concept as possible donut sprinkles with local donut shops. That might work. I feel logy just reading this thread. Wigan isn't really a seaside town. The 'pier' (not really a pier at all) is on a canal, not the sea. There ain't no shibboleth like a bread roll shibboleth. Mine is barm cake. Is the meat pie an exclusively UK/Australian phenomenon? Nope. While there are going to be differences between specific kinds, they seem nigh universal. Pot pies in the US, empanadas in the hispanosphere. pie barm...cob...stotty...oven bottom... pie floater... chip butty... logy..
Is that what they serve at the casino? I thought the only thing people imbibed at the Casino was speed? Was introduced to the Chip Butty in college, thought that was the pinnacle of carbing... I was wrong. But damn I love pies! PeterMcDermott: "Wigan isn't really a seaside town. The 'pier' (not really a pier at all) is on a canal, not the sea." Yes, but is there a road to it? I was first introduced to a chip butty from a dear friend whose family has basically never left Lancashire. I love chip butties despite being a delicacy closely associated with my football rivals. With a liberal application of vinegar or Hendos, you're in business. I wanted to go to Wigan to try a pie barm, but my friend wanted to show me the beauty of Skem instead. Came for Orwell reference, was not disappointed. If you’re vegetarian you can have a chicken pie, I suppose. Anyone know where can I get my hands on one of these in NYC? In the bad old days, before health (ie the early 90s) and when I was but a teenager7, the delicacy at my school was the roll-in-a-roll, a Four N Twenty Jumbo Sausage Roll in a buttered, crusty white bread roll, with tomato sauce. Therefore this is not so strange to me. "In 2014 there was a supplier mix-up and the wrong-sized pies were delivered to the bar, with the competition pies instead going to a divorce party." ....I have so many questions. I don't know about universal, certainly everyone's had the idea to wrap other foods in pastry but a real pie has a certain structure and consistency that a lot of other similar foods lack (Aus. interpretation here though). Potato & beef is less of a standard pie filling here but beef (for varying value of beef) is the standard and potato & beef certainly is around. I'd like to second the pie floater, but I'll grant that it's really a messier pie, whereas the pie barm is obviously a tidier enterprise. There's a particular art to eating an Australian meat pie wherein the sometimes fairly liquid filling has to be kept secure while you're chewing holes into its container, usually this means you eat it on an angle, but I'd take a barm instead. I can hear a Peter Sellers voice saying "Is it a barm?" I have not had the pleasure of trying one of these, but chip butties are wonderful (provided they are not too artisanal - sliced white, marge, and the scrapings from the fryer will do nicely). And from India we have a cousin in spirit, if not ingredients - the vada pav. Wonderful when freshly made. I get the distinct sense that Wigan is a resort in exactly the way that Chicago is a meteor impact crater. The magnificent thing about the proper chip butty is that if you get the right chips e.g. a bit greasy in the best way, you can have your fish and chips at night and then have your spare chips in a butty for breakfast. I like mine with a smear of mayonnaise but then I am an effete intellectual, like. The pie barm isn't even the weirdest food I heard of in Lancashire when I lived there. That was chips and peawet. 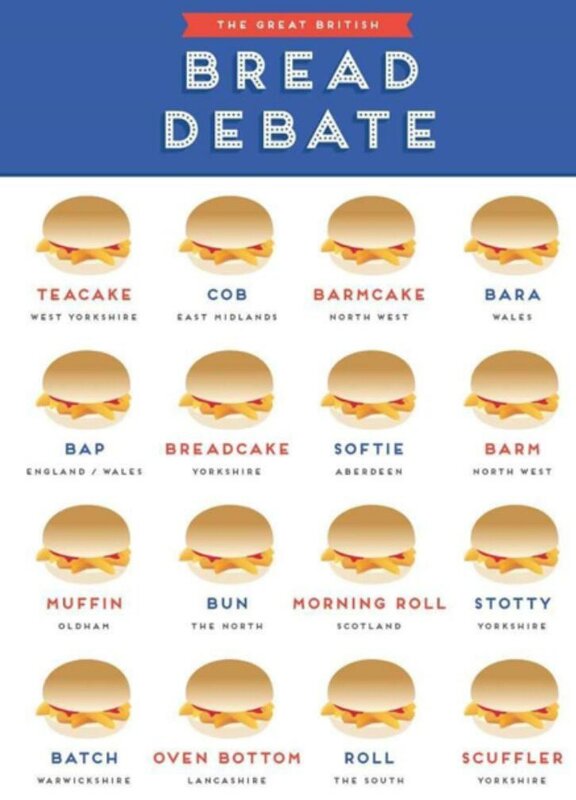 One of the things you notice moving around the country is the different words for bread in a roll sort of shape - bap, barm, breadcake, or even stotties, cobs and scufflers. It's as bad as the pop v soda wars in the US. Is the pie fried? Does it have Mac and cheese inside? Is there vinegar involved? It's no Glasgow pie roll, then. One thing I don't understand about the people of the great United Kingdom: How are you not all basically dead? I mean, everyone makes fun of American food and we certainly do have a lot of very splashy, calorie-rich, dumb food, but a lot of that is sort of showboat food, Guy Fieri stunt food. Whereas everything I can think of from the UK that's disturbingly bad for you is either obviously routine snacks for people (munchy boxes, pies full of carbs) or else actively enticing-sounding (bakewell tart, tatie scones, pies full of carbs). It's like either your default eating should kill you or your delicious food options should kill you. In America, if you can stay away from the donkey sauce and sugar-laden pizza, you're basically golden. One thing I don't understand about the people of the great United Kingdom: How are you not all basically dead? As an Englishman, my technique is to go to the USA every few years and spend three months there, cleansing and purifying my body by consuming only American cuisine. I then return to the motherland and make use of the socialist medical care system here, before venturing once more to the diners and other eateries of our Western Colonies. Yes but you see one might actually want to eat a mac and cheese pie, even in a bun, that's the key bit. I would never eat myself ill on frosted flakes or grocery store donuts, but if I lived in a place with regular access to, say, battered white pudding or tatie scones, my general health would take a dive within a week or two.